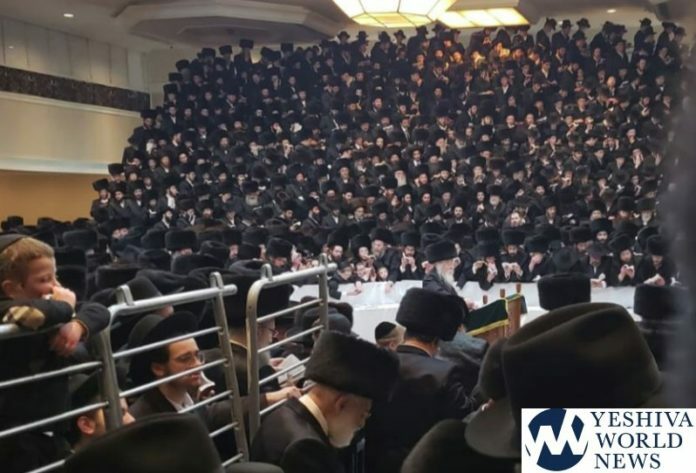 Thousands of Gerrer Chassidim joined their Rebbe in Brooklyn this Shabbos Shira, the first time in many years that the Rebbe was with his Chassidim in Boro Park for Shabbos. As YWN has reported, the Rebbe is currently in the United States, accompanying his Rebbetzin who is receiving medical care in a Manhattan hospital. “The Palace Hall” on McDonald Avenue was where the Rebbe stayed for Shabbos along with his Gabbai and son HaRav Nechemia Shlita. The Rebbe did not conduct a Tish on Shabbos, but was joined by thousands for all three Tefillos. On Erev Shabbos, as the Rebbe was making his way to The Palace Hall, he stopped at the home of the Skulener Rebbe who was recently released from the hospital, and then paid a visit to the Rachmastrivka Rebbe. Video footage of the Rebbe is rare, as the Rebbe forbids himself to be photographed or filmed. But with cell phones everywhere in NY, the Rebbe was filmed as he exited the home of the Rachmastrivka Rebbe on Friday, as well as video of the Rebbe exiting The Palace on Motzei Shabbos where he made his way back to Manhattan where he is staying for the remainder of his trip. רביעי: בחור הבר מצוה של מאיר פריי. מוסף: ר’ אברהם מרדכי כהן. אחרי מוסף היה ברית לבן של ר’ שמחה בונם פלקסר בן הרב מאיר חתן ר’ העניך קורניק. Very nice that the Rebbe doesn’t want to be photographed or filmed. That is true humility.